Our lifelong love of dogs combined with our saddlery leather crafting experience enables us to create beautiful collars and leads for dogs of all sizes and shapes. Breed specific is our specialty. Whippets, greyhounds and lurchers require a different type of collar than retrievers or hounds due to their long, thin-skinned necks. Working or hunting dogs need different types of leads than show dogs for control or easy release. Police dogs require many different leads to adjust to tracking or patrol duties. 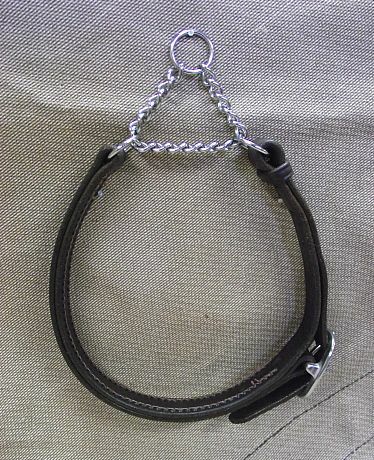 At Taylor Made Too Saddlery, we make the lead or collar that is suitable for your dog and your activities. We individually handcraft each item using only the finest quality leathers, threads and hardware in our workshop. Made of single thickness, vegetable-tanned bridle leather in Black or Brown that has been creased, edged, dyed and burnished by hand. Sewn in buckle and dee made of solid brass or stainless steel complete the look. A padded lining of soft nappa leather in your choice of a matching or complimentary colour is folded and sewn to our Simple leather collar. Padding and thread colours vary depending on availability. Discuss your preference when ordering and we’ll go from there. Wide at the front and narrow at the back, the contoured shape of this type of collar prevents injury to these sight hounds’ delicate necks. The main body is made of supple, vegetable-tanned bridle leather in Black or Brown that has been creased, edged, dyed and burnished by hand. We then add a soft nappa leather padding in a matching or complimentary colour for your dog’s comfort and good looks. You can choose either solid brass or stainless steel buckle and dee. Padding and thread colours vary depending on availability. Discuss your preference when ordering and we’ll go from there. Supple vegetable-tanned bridle leather feels great in your hand and is very strong. In Black or Brown these leads are creased, edge-dyed and burnished by hand. Complete with sewn-in handle and bolt snap of either solid brass or stainless steel. 5′ – 6′ long in either 5/8″ or 3/4″ width. When you need to keep your dog close at heel, this is the lead to use. Same craftsmanship and materials as the Training Lead but only 2′ long or less, including handle, in either 5/8″ or 3/4″ width. Black or Brown. This is a leash and collar all in one. Great for kind control of a medium or large size dog. The collar is fitted just shy of the smallest part of your dog’s neck. The padded throat piece has limited choke action and the leather keeper slides tight to prevent slip outs or loose for easy removal. The leash measures 5’long in widths of 5/8″ or 3/4″. In Black or Brown bridle leather with your choice of matching or complimentary colour soft leather sewn into the throat piece. Solid Brass or Stainless Steel dees. We can make other types of custom collars or leads for you as well. Prices will be quoted at the time of ordering according to specifics. 1/ Preferably use a soft tape measure. 2/ Place the tape around the dog’s neck where the collar would sit (approximately midway between the ears and shoulders). 4/ The measurement where the end of the tape meets the rest of the tape will give you the dog’s neck size. Round up to the nearest inch and give us that number. That will be the length to the middle hole and there will be adjustment both ways. If you are measuring a puppy, please let us know and we will be happy to make the size you give us the length to the smallest hole to allow for some growth. If you don’t have access to a soft tape measure simply use a piece of string. Put the string around the dog’s neck and mark the string with a pen where the end touches the loop. Then lay the string flat and measure on a ruler from the end to the mark.